SportsArt is an established industry leader leveraging over 37 years of innovative design and manufacturing excellence. The company consistently seeks to advance industry standards, positioning itself as one of the most creative manufacturers of premium quality fitness, medical, performance and residential equipment. 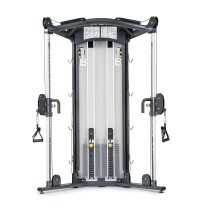 The SportsArt DS972 Dual Stack Functional Trainer offers a unique adjustable pulley ratio (1:2 and 1:4) giving users more workout options and increases weight selection options.